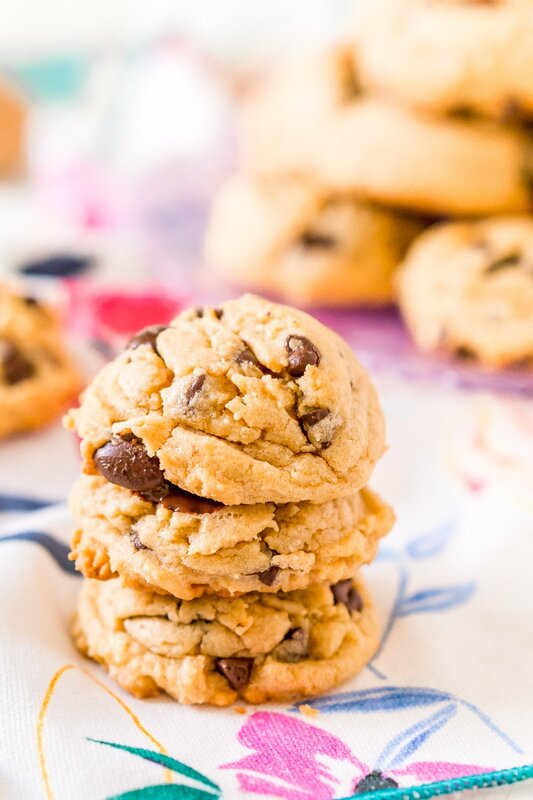 These Peanut Butter Chocolate Chip Cookies are soft and chewy and made with peanut butter, chocolate chips, vanilla pudding, brown sugar, and more! 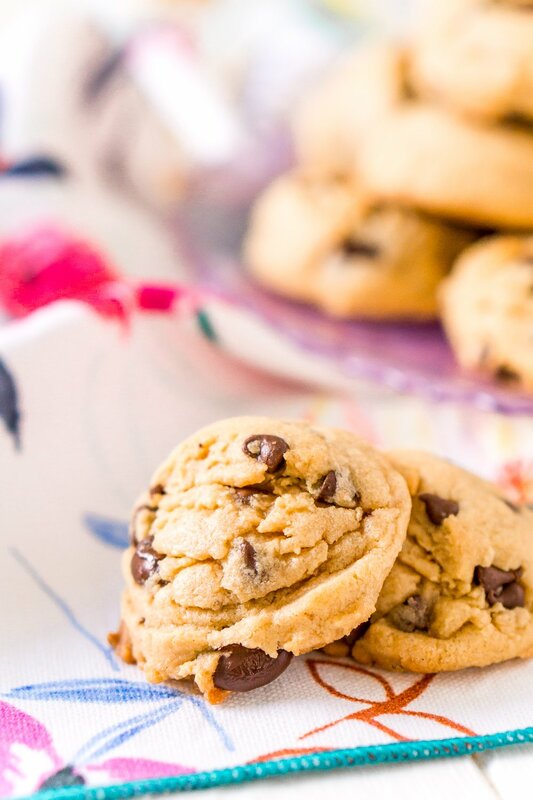 Peanut Butter Chocolate Chip Cookies are the perfect blend of sweet and salty and are super addicting! No one can deny that peanut butter and chocolate were made for each other. So it only seems natural that a classic chocolate chip cookie is made even better when laced with peanut butter, amirite? 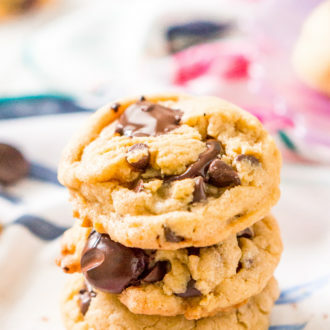 These cookies are one of my go-to recipes because they’re easy to make and there’s no chill time required! You’ll get perfectly fat little cookies with a slightly crisp outer shell and a soft and tender center. 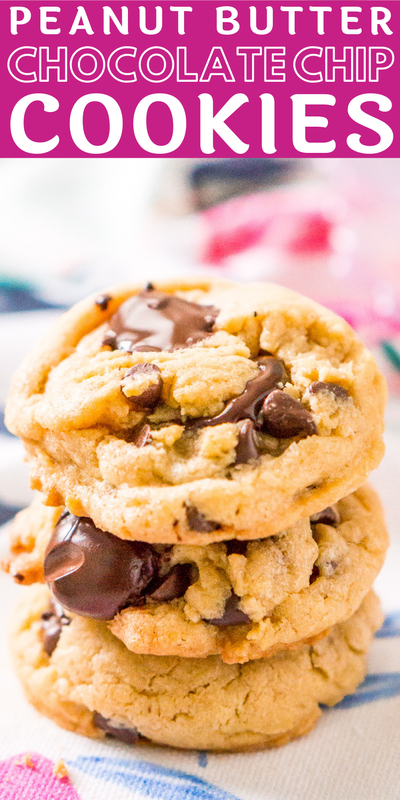 Enjoy them warm for pure bliss from the melty chocolate chips! And don’t forget to follow every bite up with a glass of milk! 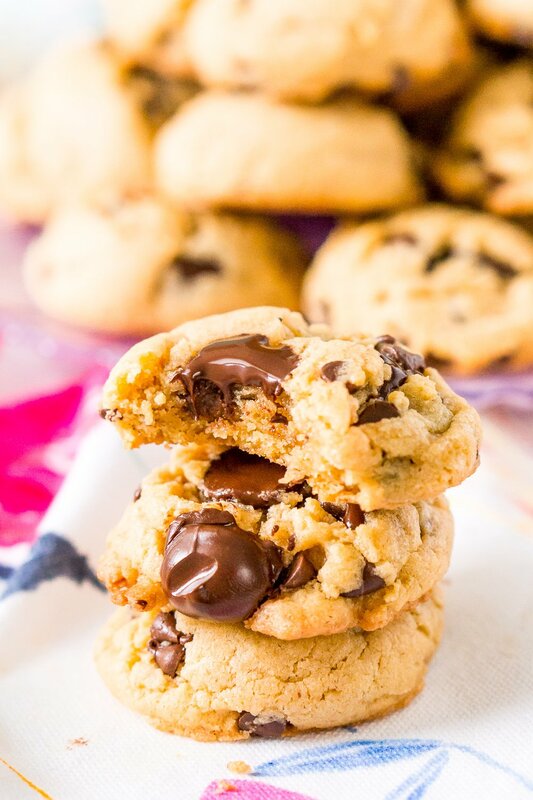 These Peanut Butter Chocolate Chip Cookies are sure to hit the spot whether it’s a late night craving or a potluck (everyone will beg you for the recipe)! 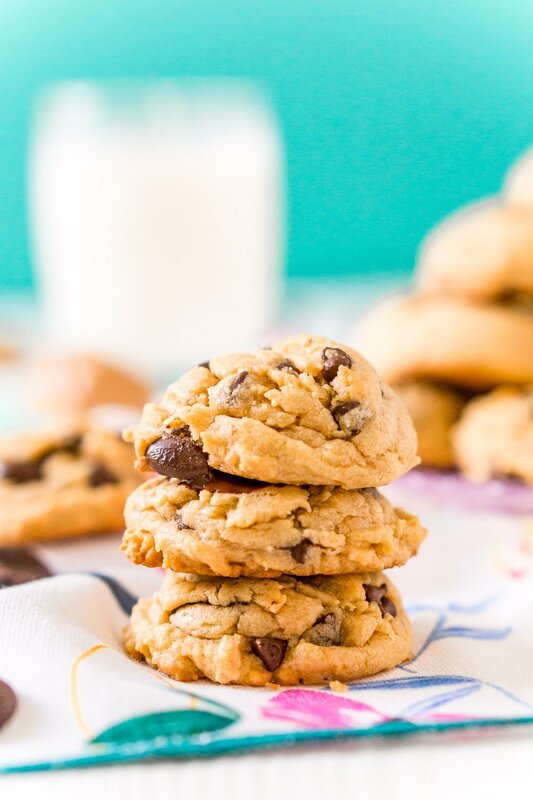 These are actually pudding cookies and the pudding itself is key because the cornstarch in the pudding is what helps these yummy Peanut Butter Chocolate Chip Cookies stay so chewy! Plus the extra vanilla flavor adds a delicious dynamic to the peanut butter and chocolate too! This is a really simple recipe to make and your first batch should be being pulled out of the oven in less than 30 minutes! Begin by preheating your oven and lining your baking sheet with parchment paper. Parchment paper is crucial so that cookies don’t stick. A silicone baking mat will work too. In either a large bowl with a hand mixer or a stand mixer fitted with paddle attachment, cream together the butter, peanut butter, and sugars until smooth. Then, add in the pudding, eggs, additional egg yolk, and vanilla and beat until combined. In a separate bowl, whisk together the flour, baking soda, and salt. Add the dry ingredients to the wet ingredients and mix until combined. Lastly, fold in chocolate chips. I like to use two different sizes and two different kinds (milk and dark) for even more flavor! For evenly sized cookies, use a medium cookie scoop to make 1 1/2 tablespoon sized scoops of dough onto the prepared cookie sheet about two inches apart. Bake the cookies for 10-13 minutes. Remove from the oven and allow the cookies to cool on the cookie sheet for a couple of minutes before transferring to a cooling rack. I tend to bake them on the lower end because I like my centers slightly underbaked. These cookies will stay soft on their own for a few days in an air-tight container. To extend their chewiness beyond that, I recommend adding a slice of bread to the container as well. Freezing Cookie Dough: Portion out the dough as you normally would with the cookie scoop and freeze the dough on a cookie sheet until solid. Then transfer the cookies to a freezer-safe container or bag and bake within 9 months. 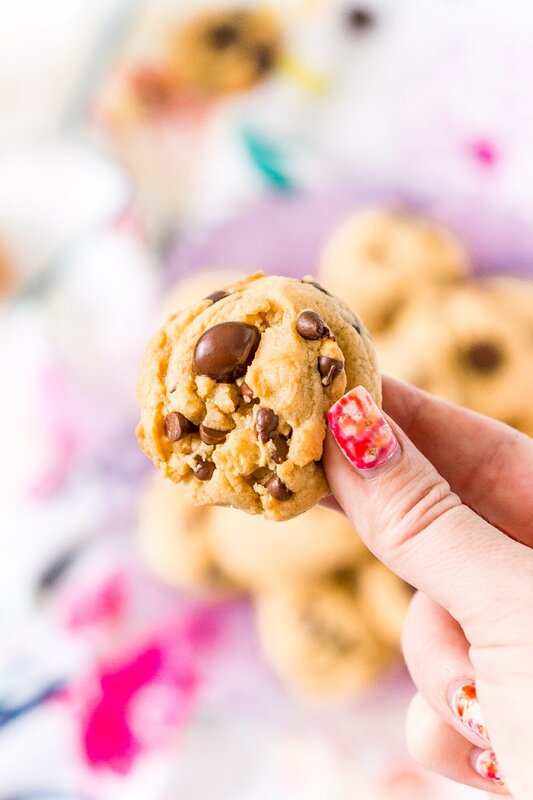 To Bake From Frozen: The best part about freezing the dough is that you now have Ready-To-Bake Cookies for when cravings strike! Simply bake 2 to 3 minutes longer than the fresh recipe calls for! 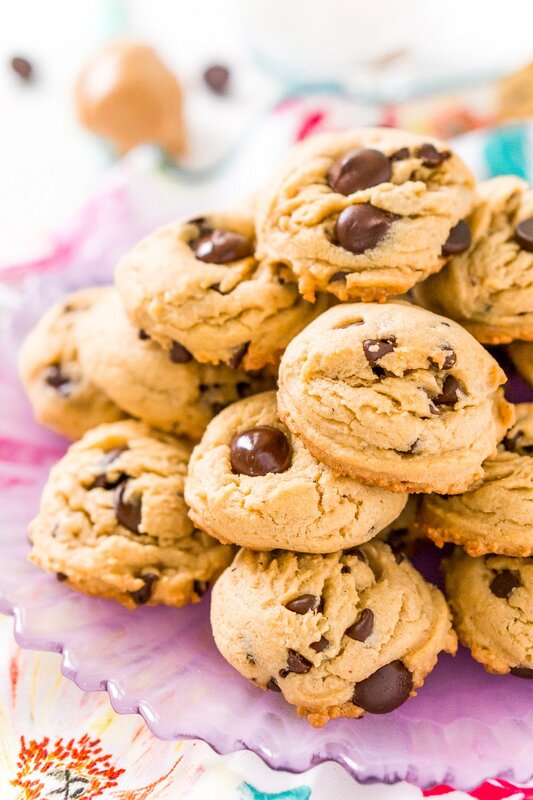 Freezing Baked Cookies: Once baked, allow the cookies to cool completely before packaging up in a freezer-safe container and freezing for up to 3 months. To thaw simply remove from the freezer and allow to sit at room temperature. This post was originally published in October 2014 and was updated in January 2019 with new photos and content. Preheat the oven to 350 degrees F and line a cookie sheet with parchment paper or silicone baking mat and set aside. In a large bowl or stand mixer fitted with a paddle attachment, cream the butter, peanut butter, and sugars together until smooth. Add in the pudding, eggs, additional egg yolk, and vanilla. Beat for 1 minute on medium speed. In a separate bowl, whisk together the flour, baking soda, and salt. Add dry ingredients to the wet ingredients a 1/2 cup at a time and mix until combined. Bake for 10-13 minutes. Remove from the oven and allow the cookies to cool on the cookie sheet for a couple of minutes before transferring to a cooling rack. These were delicious!!! They have a wonderful flavor and texture…and I love how soft and “plump” they are. 🙂 They were a big hit! Thanks for the recipe. So glad you enjoyed them, Kara! I not getting a ‘dough” out of this. Only s powder??? Never had this happen? Checked and double checked ingredients three times??? Hi Cheryl, I’m sorry to hear that you’re having issues with this recipe, but you definitely shouldn’t have a powdery mixture, if you’ve added the eggs, butter, and peanut butter, those “wet” ingredients should help to bind the dough.